Recently I have been doing a lot of building niche websites and blogs. I have learned a lot through my extensive research and through actual testing in various markets. For anyone who is thinking about building a niche website or blog, there are some basic, yet fundamental aspects you need to look at before you dive into a niche. REMEMBER, if you don’t do these 5 things properly, what you do afterwords won’t matter. One of the main factors that you need to start with is analyzing the keywords and making sure that the website that you are going to be building is focused on a niche that has search volume. Something I learned very quickly that there is a big difference between BROAD match and EXACT match. Broad match search volume is very misleading, because it incorporates other searches that contain the keyword/phrase in a users search. When you are performing your keyword research, make sure you are looking at exact match. It will give you a much more accurate idea on the amount of search volume a specific niche or phrase is receiving. Personally when I am researching a niche I try to find a niche that has between 3,000 – 10,000 searches per month. Obviously the more volume the better, but what I have noticed is that once you get over 10,000 searches a month, the competition becomes much more fierce. To get an idea of how much competition there is for a niche, try using the “Allintitle:” search command to see how many other competing websites you are going up against. As you will see in this example there are 435,000 other websites that contain the words “south beach diet” in their title tag. You can take it a step further and put the phrase in brackets for exact match. I like to try to find niches that have under 30-50k competing websites in it. Obviously the more competing websites in the niche, the harder it is going to be to earn page 1 rankings. Ok, now that we have analyzed the keywords and saw how many competing websites are in that niche, we want to analyze the websites on the first page of Google. We want to see how optimized each of the sites are – meaning we will look at the number of backlinks, domain age and how much content they have. If all you see are authority sites like Wikipedia and Industry sites like WeightWatchers.com, its going to be hard to rank above them. Using a tool like SEO Quake or the SEO Toolbar will help you analyze each of these websites. Take close note of the number of backlinks, pages indexed and domain age. If the top sites have tens of thousands of backlinks, thousands of pages indexed and the domains are 5-10 years old…again another indication that you could be in a competitive niche. Looking to see if there are people paid for traffic via PPC, that is a good indication that there is money to be made in your niche. If advertisers are spending money to drive traffic to their websites, the odds are that is a lucrative market. On the other hand if you see that nobody is bidding on certain keywords, it probably means there is no search volume and/or no money to be made in the niche. One place I always check is Clickbank.com. 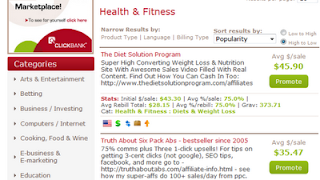 Clickbank is a marketplace for affiliate products, where affiliates can promote other peoples products, and product creators can list their products for affiliates to market. Feel free to sign-up for a free account and go to their Marketplace to dive into a category that is relevant to your niche. Take a look and see what affiliate products are available. If you see that there are no other products in your niche, it probably means there is no money to be made. However if there are lots of other products in the niche being offered on Clickbank, there is a reason for it….people are making money. You may also want to take note of the affiliate products listed in the Marketplace so you can being to promote those products on your niche website/blog. 0 Respones to "5 Basic Tips for Creating Profitable Niche Websites and blogs"